When you arrive at the homepage of Anthony’s website, you can immediately feel a sense of expertise. 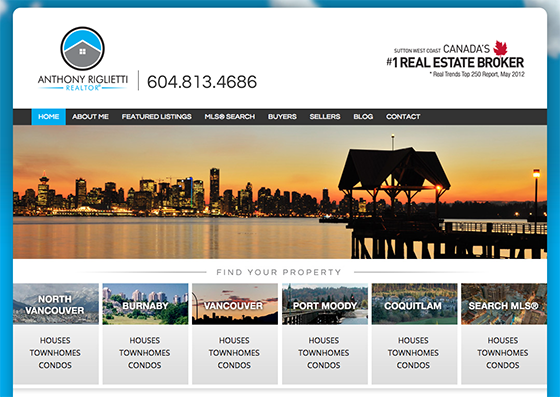 Not only has he provided his #1 Real Estate Broker badge clearly at the top right of the site, but he has also listed with images the neighbourhoods in which he operates. The use of photo links ‘above the fold’ on the home page has a greater impact in associating with the visitor than, say, text links that said the same thing. The lesson? Visuals are powerful, especially when your goal is to drive visitor engagement and increase the time visitors spend on your website. By offering visual cues, Anthony not only harnesses the full power of his home page, but he aligns his obvious expertise with specific communities in the Lower Mainland. Well done, Anthony. Was AnthonyRiglietti.com taken? Nope. I mean it is taken… by Anthony himself! Only he chooses to forward that URL to his main website: FindYourProperty.ca. This is the URL that he uses to promote his real estate brand, which may appear odd because normally agents purchase firstnamelastname.com for their business. Anthony has taken a different approach to marketing real estate online. By directing his traffic to “FindYourProperty.ca”, not only is he making the company appear larger and more credible than a singular real estate agent… he is also appealing to some rather important search engine algorhithms, helping visitors find his website more frequently. Your website URL isn’t the most important piece of your SEO puzzle, but when you have a unique name like Anthony’s, a branded and real estate specific URL can be of great benefit, and Anthony gets that! 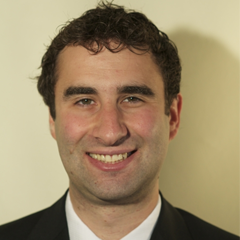 My name is Anthony Riglietti, and I am a REALTOR® with Sutton Group – West Coast Realty, I take great pride in our city as well as in serving my clients and neighbours. As your REALTOR® you can be confident that I will always put forth great effort assisting you with the purchase of a new property, or the sale of present property, or providing local information to new residents and businesses.